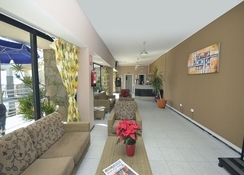 Situated in a narrow rocky valley near Gran Canaria’s southwest coast, Colina Mar Apartments are a great option if you are looking for peace and tranquillity away from the hustle and bustle of a popular beach town. Breath-taking rural vistas stretch out in every direction, while the nearest beach takes around thirty minutes on foot. The apartments are tastefully decorated with pale yellow walls and sea-blue linen. Each one comes with separate living areas and kitchenettes, so that you can serve yourself all your favourite dishes during your stay. The apartments have private balconies that afford stunning views of the sea. 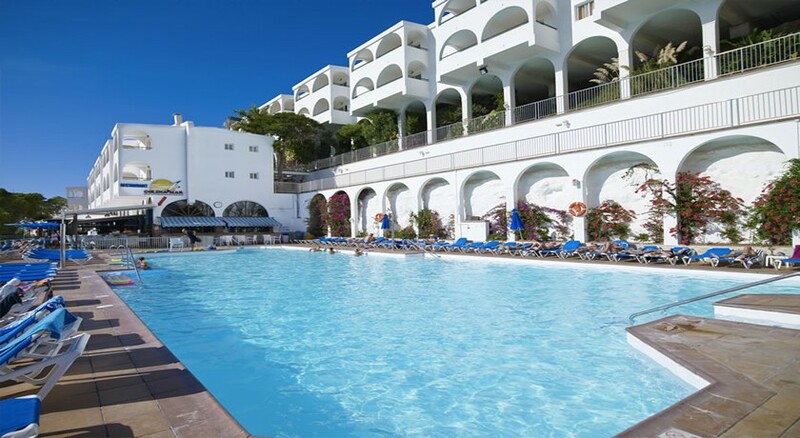 Outside the hotel, there are two expansive pools with sea views, where you can either lounge to your heart’s content or swim at a leisurely pace soaking up the warm Atlantic sun. The buffet and a la carte restaurants prepare a range of local and international delicacies. The hotel also offers a variety of entertainment options for guests of all ages, and includes pool games, water sports, kids’ club, playground, after-dinner entertainment and cabaret-style shows. 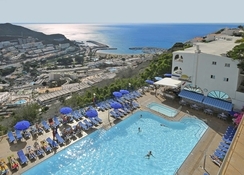 Located in the south west corner of Gran Canaria, the hotel is 50km from the airport and 2.5km from the beach. The famous Europa Shopping Centre, bustling with boutiques, souvenir shops, restaurants and bars, is located at a distance of about 100 metres. The strategic location of the hotel, tucked into a hillside overlooking the picturesque Puerto Rican Valley, means that while you get to enjoy the calm and tranquillity of the Spanish countryside, you don’t need to forego all the fun-filled activities that a popular beach resort has to offer. Colina Mar Apartments have 184 fully furnished apartments that come with fridges, kitchenettes, tea-and-coffee makers, maid services, balcony with sea view and so on. Each apartment comes with a twin bedroom with provisions for an extra bed in the lounge area. The maximum occupancy is three adults or two adults and two children under 12 years of age. There are maid services five times a week, towel change three times a week and linen change once a week. The hotel has an all-inclusive option of breakfast, lunch and dinner. Along with a buffet restaurant, there is also an a la carte restaurant within the hotel premises. All dishes are prepared with a distinct Mediterranean flavour. The staff of the hotel regularly put up themed events such as Italian nights, live cooking shows and barbecue by the pool. There’s also a snack bar for munching on any time of the day. Alcoholic beverages are served in the disco bar of the hotel until 11pm. There are two swimming pools, which are heated during the winter months, two pool bars, sunbeds and parasols near the pools. The hotel has a children’s pool, a kid’s club and a large playground to keep the little ones busy. Evening entertainment programmes include cabaret shows, tribute acts and a disco bar for tapping your feet to thumping music. First time abroad at the ripe old age of 51. Apartment was spacious. Clean and had everything you need to make your stay comfortable. Staff were accomodating and spoke english. Nothing was a problem with them. Very friendly atmosphere. Entertainment was great. Close to shopping centre for your supplies plus shop in the complex. Food was hot and very enjoyable. Got to try new stuff. Overall a very enjoyable stay. Only downfall was coming home..
We went self catering but decided to upgrade to all inclusive (purely for drinks) - it was €25 a day which was really reasonable. Breakfast was ok, lunches were really nice, we only stayed for dinner one night because we wanted to go out each night but it was nice. It wasn’t anything special but for a 2 star it was excellent value. The other guests in the hotel were lovely and we made plenty of new friends. Again, we went at a really quiet time, and if it was busy it might have been different. We didn’t travel with children but there was a child’s entertainer there and a club room, and the children at the hotel looked happy and entertained! We didn’t stay for the evening entertainment because we went out. Plenty of bars and restaurants nearby, and it was €4 for a taxi down to the main area (and the beach)which was well worth it. Lovely food, decent entertainment and helpful smiling staff. Nice apartment very clean and with lovey views from balcony. I would recommend.and are near shops and taxis to the beach are cheap.the gym is not that good apart from running machines.